Do you study Political Science, International Relations or Security Studies? Are you an interdisciplinary candidate with qualifications in Economics, Finance, or Human Resources? Have you studied Information Technology, Web or Graphic design, or Library Sciences? Do you study Aeronautics or Engineering? Do you have a background in Media, or Journalism? Do you speak Russian or Arabic? 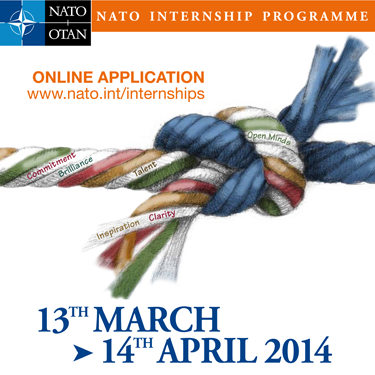 The 2015 call for applications for NATO-funded internships will open on 13th March and close on 14th April 2014. Candidates wishing to apply for a GRANT Funded only can submit their application through the online portal available under "Application". NATO Headquarters (HQ) introduced its Internship Programme in 2004. The aim of the programme is to provide a small number of current or recent students with the opportunity to intern with the International Staff at NATO Headquarters in Brussels and in a few other NATO bodies. There is one call for applications per year in Spring with two starting dates, in March and in September the following year. Internships will in principle last 6 months.